Door bottoms, also called door sweeps, are an inexpensive and effective way to increase draft protection in your home. Door sweeps and bottoms are attached to the bottom of your door to provide a physical barrier, typically rubber, against cold that could seep through the crack between the door bottom and floor. Read on for everything you need to know about replacing and installing door sweeps & bottoms. The easiest to install. Slide off the old sweep, slide on the new. Can normally be installed without removing the door. They fit into a kerf cut in the bottom of the door. Easy to install and are adjustable but sometimes requires installing new holes in the door. Requires removing the door from the frame. This type of door bottom is generally found on wood doors. 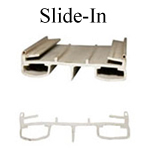 Steel and Fiberglass doors normally use the slide-on or snap-in type. 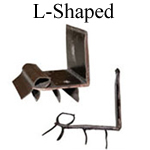 Benchmark steel doors use a L- shaped bottom. Peachtree bottoms are a heavy rubber that is fitted into the bottom of the door. Wood doors are almost always a nail or staple-on type door sweep. The wrap-around and L-shaped door bottoms are screwed into the inside surface of the door; if you remove the screws, the door bottom comes off. Determine which door bottom is needed. The slide-on sweeps come in different designs. Remove the existing door bottom; most just slide off. Cut new sweep to length if needed. Slide on new door sweep. If door sweep fits too loosely, a spot of adhesive or caulk may be applied between the sweep and the bottom of the door. Determine which door bottom is needed. 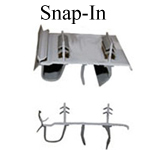 The snap-in door bottoms come in different designs, and sometimes even the heights of the door sweeps will vary. Most of these types of door bottoms have a single or double kerf cut in the bottom of the door for the sweep to lock into. The spacing of the kerfs vary and you will want to match profiles. Remove the existing door bottom. Most just pry off. Cut new door sweep to length if needed. Snap or push new door sweep onto bottom of door. If sweep fits too loosely, a spot of adhesive may be applied to hold it in place a little more. Determine which door bottom is needed. 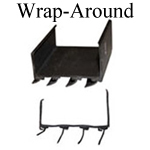 The wrap-around sweeps fit different thicknesses of doors. Most exterior doors are 1-3/4" thick. Some older homes have doors that are 1-3/8" up to 2-1/4" thick. Remove the screws on the existing door bottom. Cut new door bottom to length if needed. Position new door bottom onto bottom of door. Close door and adjust door bottom as needed to get the proper fit. Apply new screws to hold door bottom in place. Be careful not to fit the sweep too tightly. If there is too much pressure on the bulbs or fins it will wear out faster. Determine which door bottom is needed. 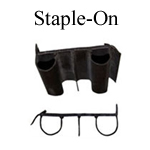 The staple-on sweeps come in different designs, and even the heights of the door sweeps will vary. The goal is to match profiles and especially height. Remove the hinge pins from the door. Lay door on its edge. Be careful not to position the door where it can fall or become scratched. Cut new sweep to length if needed. Position new sweep onto the bottom of the door. Note: The staple-on door bottom may seal better if a small spot of adhesive or caulk is applied to the bottom of the door before installing. Use just enough to touch both surfaces. Staple from the center and work your way to both ends. This will reduce the likelihood of ripples forming in the door bottom when it is affixed to the door. It is also best if the staples are staggered to both the inside and outside of the door sweep. Re-install door. Note: If replacing door by yourself, be careful not to hurt yourself. Some wood doors are very heavy. The use of shims under the door may help with the alignment when connecting the hinges.